This paper aims to discover a proper categorical framework for understanding the branch of seventeenth-century poetry that portrays nature, which appeared following "Kangho" Sijo of the sixteenth century. Is it to be approached under the rubric of "Jeonga Sijo" (pastoral lyrics) or included in "Jayongnong Siga" (independent farmers songs)? If neither is a valid category, is there any alternative? This is the starting point of the problematics that this essay develops. To reach a solution, this essay focuses on the following two aspects: first, whether to consider the historical character of the ``Jaeji Sajok" (local gentry), who were the main producers of the seventeenth-century poetry on nature, in terms of differentiation or of continuous development secondly, whether the aspects of nature described in this seventeenth-century poetry on nature retain the characteristics of Jeonga or those of Jayongnong. In pursuing these questions, a tentative conclusion is reached: the seventeenth-century poetry on nature includes a type of works that should be categorized into Jeonga Sijo as well as another type that should be classed into Jayongnong Siga. Finally, the necessity to make solid this tentative conclusion calls for a more detailed and rigorous study of the historical characteristics of the seventeenth-century Jaeji Sajok. Today, Pansori, which is the core of the national culture, is starting to ensure the foundation of its autogenous transmissional power. However, the problem is that the repertories of the Pansori are not yet various much. What can we do so that the Pansori may take hold upon the current context of reality? There have been some movements to activate and disseminate Pansori with a critical awareness of the current problems. Such efforts have been led by young Pansori singers. For example, Kyu Ho Lee concentrates on transforming the difficult narrations of Pansori into easy and familiar narrations for general audiences. Many Pansori singer also shows his great interests in the creative popularization of Pansori. Pansori will be a successful performance when the literary narrations and the artistic expressions of the great singers are skillfully combined. It will also be helpful to activate Pansori when more great writers become interested in writing the narrations of the Pansori. `Torangkangdae Contest` or `Insadong Street Soripan` which has very experimental characterizations emphasize the prestige of the Pansori. The institutional system for the intangible cultural assets give the positive impact of Pansori as it is passed down readily to the next generations. On the other hand, the system gives us some negative effects and a feeling that Pansori has become very standardized without any variations. It reduces the vitality of Pansori which is one of the main characteristics of Pansori. Nowadays, interest in Pansori and its traditional culture has been increasing greatly because the spirit of the times emphasizes the identity of the national culture. 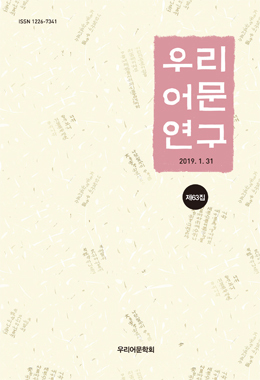 However, we have lost the true nature of Pansori which contains keen satire and which evokes insights into life with an awareness of realistic problems about life. Therefore Pansori becomes just a kind of high culture. If we want to revive Pansori as a real art form, it is necessary to find the true nature of the Pansori. The future of the Pansori will be very bright when young critical Pansori singers bloom in their spirit of experimentalism. The purpose of this study is to explicate the material singularities and meanings of and . The principal ingredients of are manifold characters who were actually subsisted in the real history and dreadful sights of Japanese Invasion of Korea in 1592. In comparison with , chooses a specially used plant, Namcho(南草), for a main material and brings focus into that plant. In this respect, the conclusion of this paper is as follows. First of all, by appearing real characters of history, intends to infuse Patriotism and National consciousness into the heart of Korean people suffering from Japanese invasion. This is not out of all relation to the fact that Choi Hyun(崔晛), the author of , took an active part in loyal troops against Japanese Invasion of Korea in 1592. Second, the fact substantiates is a Gasa(歌辭) mostly reflecting the feeling of people of Youngnam area(嶺南人) because most of the main features in are people of Youngnam area Finally, bears out an inclination of multilateral ingredients of Gasa in the 17C. This propensity is significant that Gasa diversifies themes and materials of work in contrast with the product written before the 17C. There was few literary production which showed numerous real names of characters up to then. In accordance with , tobacco cultivation was widely spread. And the fact that shows such a special ingredient be a material of Gasa is also considered as a phenomenon of multilateral ingredients. Moreover, tobacco played an important role in reminding of Worship of Heaven. Under the control of Confucianism, loyalty and filial piety is the main current of society. On that account, , which chose a tobacco as an primary material and manifested the Worship of Heaven instead of loyalty and filial piety, has an important significance. Chijadang kang Damun was the Kisaeng who became a concubine of Chasan Baechn and lived in Kimhae area in the late 19th century. Baechn showed Kang`s poetry to Yi Chagng, Bae`s cousin on the mother`s side, and Yi Chagung published Chijadang`go, the collective poems of Kang Damun. The fact that Yi Chagung who was a man of the royal family and beloved vassal of King Kojong published the works of a Kisaeng is worth to give an attention in terms of the history of issuing Kisaengs literary works and its meaning. It seems to be related with the policy of Taewon`gun who tried to control the talents of Kisaengs in the years. Tam`un was famous Kisaeng of Kimhae region. She seems to have gotten the honorable name of Myeonggi, a great Kisaeng, not only because her gifts of singing, dancing and writing, but also because her constant love for Chasan all her life. The name of Myeonggi made a considerable social status in Choseon period, and Tam`un wrote her life as a story a Myeonggi. Her life as a Myeonggi and concubine was highly restricted. Damun could not get out of the stereotyped life and the fixed patterned love because she chose to live as a Myeonggi and accepted that kind of life for herself. Therefore, she could not overcome her status restricted by the rigid class system while she lived in outer area such as Kimhae, though one might expect a big tuning point after she came into close relation with the royal family of the central area, and her literary works were published by a member of the royal family. However, eruptions of strongly intensive sentiment were accompanied by her eyes on the lives of her colleague Kisaengs. It was because Tam`un could see the intricate webs intertwined with the institutional problem of the Kisaeng system and with the sentimental problems such as hatred and loneliness in the lives of her colleague Kisaengs. In addition, Damun found the oppressing factors behind everyday lives of a Kisaeng and exposed them all. She introspected Kisaengs` lives and found the systemic and structural problems while describing daily lives of her colleagues. By doing this, she could re-recognize the sexuality of Kiseangs. The purpose of this study is to establish a type of style in enlightening novels by analyzing the attributes of "Moo Jung"(1917) by kwangsoo Lee(1892-1950), which is regarded as a model for enlightening novels in Korean modern literature. The first issue in the study of style is to establish the conception of style and the method of study. Even though traditional studies of style have usually understood the former in terms of authors individualities or of characteristics in the period, I think that there are a few of difficulties. Therefore, I`d like to restrict the conception of style and the subject of study within each work. Also I would try to define the style as the unique attitude of author toward the world, considering that linguistic devices are always related to the attitudes of author in the works. My method could start from finding out a style marker that produces the aesthetic effects in a work and analyze its function and effect within a work. If I summarize the result of analyzing the attributes of "Moo Jung", as an example of enlightening style, it is that the main character, Hyungsik Lee, puts emphasis on appearances or behaviors of people whom he watches, not on the inside. In other words, he accepts his perception without doubt. He prefers improving his romantic imagination to understanding the object impartially. Also there are many examples of judging others by partial standards. Moreover "Moo Jung" concentrates on dramatic narrative that leads the insufficient present to the sufficient future. It shows the structure of narrative emphasizing not its process but its result, as we can see that Hyungsik or Sunhyoung regard the present lives as temporary and often fancy the future. The metaphor is a means to persuading and refreshing emotions instead of a way to finding the reality. Such attributes of style in "Moo Jung" could be understood to be a type of enlightening style, if we divided the style to the reflecting one by the will of negative subject and the enlightening one by the positive subject. The work of figuring out the attibutes of style in "Moo Jung" and of establishing a type of enlightening style means studying not only changes in the works of Kwangsoo Lee after Sam-il movement but also advances in Korean novels of other authors who have yielded the varieties in style.